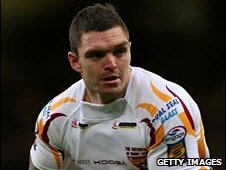 Robbie Hunter-Paul believes Danny Brough's injury is a major blow to England, ahead of Friday's match with the Exiles at Headingley. The Huddersfield Giants half-back suffered ankle ligament damage in the win over Castleford to put his England debut on hold. Hunter-Paul told the BBC's Super League Show: "He would have given England a different dimension. "His kicking game is incredible and you need a player like that." Brough switched his allegiance from Scotland, who he captained, to England at the start of the season and was the only uncapped player included in Steve McNarama's squad to face the Exiles on Friday night. Hunter-Paul added: "From a team point of view when your half-back can put big plays in with their kicking, like gaining 40-20's, it makes a massive difference. "It's a big blow for Danny too and I really feel for him. He has been building his career up in recent years, especially at Huddersfield. "This was a big chance for him to set himself on the international stage and build a long international career. So it's really disappointing for all concerned."